V2269. HERMANN JADLOWKER, Vol. II, incl. Arias from La Traviata, Pagliacci, La Bohème, Der Fliegende Holländer, Faust, Don Giovanni, Il Barbiere di Siviglia, Die Entführung aus dem Serail, Prodaná Nevesta, Evgenij Onëgin, La Juive & Tannhäuser. (Germany) Truesound Transfers 3115, recorded 1908-09 (whereas the Marston set covers 1912-28). Transfers by Christian Zwarg. 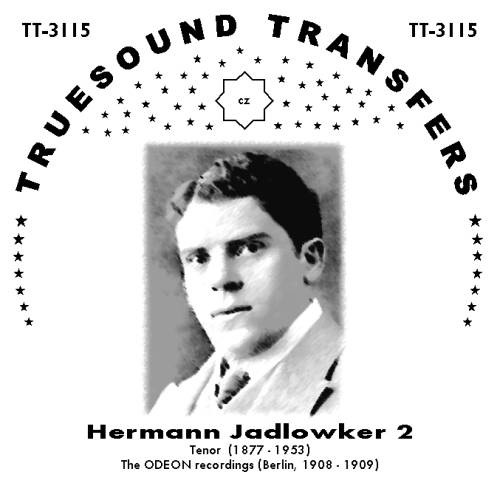 “Hermann Jadlowker was one of the most unusual tenors of the twentieth century. His recorded voice has a slightly baritonal timbre, but he also was able to produce high notes with ease and exhibit unbelievable agility. His ‘Ecco ridente in cielo’ abounds in trills and runs, while his ‘Fuor del mar’ demonstrates his coloratura singing. With the baritonal characteristics of his voice (he might well have been classified as a ‘baritenor’ today), and incredible virtuoso abilities, he would have been even better in Rossini’s OTELLO than in Verdi’s—or in that composer’s ERMIONE than IL BARBIERE DI SIVIGLIA. But this is not to denigrate his ‘Ecco ridente in cielo’—one of the all time great tenor records. It is only unfortunate that while he was active, so many of Rossini’s serious operas calling for a baritenor role were out of fashion and had been completely forgotten for close to fifty years. Still, his recorded legacy leaves us a great deal to be grateful for and admire, including the best recordings ever of arias from Flotow’s ALESSANDRO STRADELLA; Auber’s LA MUETTE DE PORTICI and FRA DIAVOLO; Mozart’s IDOMENEO; and Rossini’s IL BARBIERE DI SIVIGLIA. There is a magnificent duet from LES HUGUENOTS with Frieda Hempel, and another from DIE LUSTIGEN WEIBER VON WINDSOR with Josef Mödlinger. Nevertheless, it would have been wonderful to to hear him in other excerpts from French grand opera, where he particularly excelled. Jadlowker obtained an engagement at the Municipal Theatre in Cologne and made a début there in 1899. His Met début, 22 Jan. 1910, was as Faust, a role he repeated in Philadelphia a few weeks later….the Met had [a] world premiere, that of Humperdinck’s DIE KÖNIGSKINDER (28 December 1910). With Jadlowker in the latter work were Farrar, Homer, Goritz and Didur. During his third and last Metropolitan season, he took part in three American premieres: LOBETANZ (Thuille) on 18 November 1911, LE DONNE CURIOSE (Wolf-Ferrari) on 3 January 1912, and VERSIEGELT (Blech) on 20 January. With him in the LE DONNE CURIOSE were Farrar, Scotti, and Didur, Toscanini conducting. In spite of the fine cast, the opera was apparently unsuccessful, achieving only four repeats. 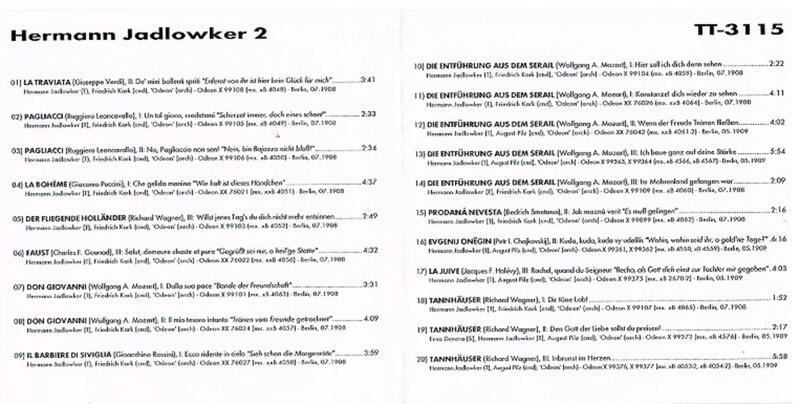 Still, Jadlowker and Farrar did record a duet from the work for Victor.